What better way to learn about Cambodia than to visit the capital city itself? A guided sightseeing trip or day tour around the capital city of Phnom Penh helps you learn about the lifestyle of Cambodian people, their colorful culture, and how they manage to rise from the tragic history of the Khmer Rouge regime. In your Cambodia tours, spend a day trip or short excursion in Phnom Penh, you will embark on an emotional roller coaster ride. As the capital not only welcomes you with impressive monuments but also takes you to war museums that are not made for the squeamish. Our best Phnom Penh day trips and excursions 2019 will take you to beautifully-adorned buildings such as the Royal Palace, the Silver Pagoda, and a number of temples that shape the belief of Cambodian people. Towering attractions such as Independent Monument and the Victoria monument are also good for some photo opportunities. There are also a number of places where you can learn about Cambodian culture and history such as the National Museum, the Genocide Museum, and the Killing Fields during Phnom Penh tours. Having a stroll through the sprawling market of Toul Tumpong or the Russian Market also help you engage with the locals and learn about their colorful daily life. Below are some suggested itineraries for Phnom Penh tours & day trips. If you want to make some changes, please contact us to customize your own Cambodia tour package! The Royal Palace is considered a proud symbol of the Kingdom of Cambodia, becoming a "must visit" sights during Phnom Penh tours. The Palace is a combination of many Khmer architectural works combining the magnificent and splendor French style, as the residence of the king and royal members. Particularly, outside the Royal Palace is also famous for the Silver Pagoda, where the precious Emerald Buddha is kept. Silver Pagoda is a famous temple of Cambodia and attracts many tourists in their Phnom Penh tours. Here you will be overwhelmed by the architecture of this place. Silver Pagoda has 5329 pieces of silver on the floor, each piece is handmade and has a relatively large weight. The Silver Pagoda also has many valuable objects such as the statue of Buddha Di-Lac is cast in gold and diamond attached. Situated in the center of Phnom Penh, the National Museum of Cambodia is a treasure trove of archeology and Khmer culture with large collections of antiques, religions, and art from the 4th to the 13th centuries. 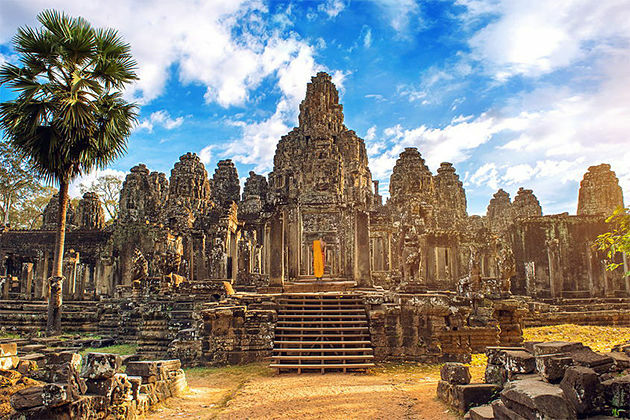 In addition to learning about the history of the people of Cambodia, coming to the museum you will see a beautiful and splendid architecture when mixed with Khmer and French style. If you want to learn the darkest history of Cambodia, you can go to explore two extremely scary destinations in your Phnom Penh tours: Choeung Ek Death Field and Tuol Sleng Genocide Museum. Pol Pot's Khmer Rouge genocide has given the Cambodian people a traumatic past, and remains to be seen is the Death Field and the Tuol Sleng Museum. Coming to these two destinations, travelers will feel shivers and mourn for the innocent Cambodians, grave mass graves, grievances with brutal torture, and so on. Phnom Penh independent monument is one of the famous sights in the capital of Cambodia. The monument is a typical architecture of Wat Pho, with stupa-shaped Angkor Wat. Beneath the monument is a fountain, especially visitors will admire the beauty of the monument at night with colorful lights full of color. Wat Phnom is one of the largest temples in Phnom Penh. This is a sacred temple that tourists should not miss throughout Phnom Penh tours & day trips. On the way to the temple, visitors will meet the statue of the god Naga and two monks - familiar animals in the belief of the Cambodian. Behind Wat Phnom temple is the Penh temple. Next to Wat Phnom is the statue of the goddess - where many visitors go to worship. Wat Ounalom is one of the most important temples in Phnom Penh and is the Buddhist headquarters in Cambodia. With a unique architectural complex, this sacred temple attracts pilgrims from all over the country and is a popular tourist attraction when coming to Cambodia. Despite much damage during the Khmer Rouge, many statues of the temple were restored and rebuilt. Wat Ounalom is the focal point of the Buddha's eyebrows (the Khmer language is called Ounalom) which still exists through many historical ups and downs, which are stored in the building behind the main temple. Situated along the banks of the Tonle Sap River, Sisowath Quay is known as the new West town in Phnom Penh (to distinguish it from the old Boeng Kak Lake town). As one of the exciting entertainment venues included in Phnom Penh tours, Sisowath Quay is always busy with lively restaurants, cafes, and bars. In the evening, it is a place where locals and locals can enjoy fun music bars, drink Angkor beers with friends and enjoy the view of the city's vibrant nightlife. This is also the ideal place for your Phnom Penh day tours to see boat races during the water festival to celebrate the New Year in Cambodia. Traditional markets in Phnom Penh is attractive shopping destinations that visitors can not ignore. Many markets such as Central Market, Russian Market, Orussey Market are places to sell a variety of goods, diverse, many types such as Cambodian specialties, garments, souvenirs, handicrafts, gold or silver jewelry, ... When shopping in those markets you should negotiate the price with the seller. This is a baguette of French origin. This dish mixed with Asian and Western flavors is popular along the streets of Phnom Penh. Num Pang is a kind of parmesan sandwich, butter or mayonnaise, with some slices of papaya, carrots, pork chops and some spicy chili sauce for the perfect dish. Dubbed the "national dish" by the Cambodians, this noodle is enjoyed by the Cambodian people every morning. These are noodles made from delicious fermented rice, added to curry fish sauce with citronella, lemon, and yellow saffron. If you are planning a Phnom Penh tour or day trip, do not forget to enjoy the hot noodle bowl next to the plate of raw vegetables, bean sprouts, cucumber, and spicy chili sauce. Every morning at 8:30 am, the atmosphere in the cafeterias in the streets of Phnom Penh is rampant as the diners call Bai Sach Chrouk, a simple style of pork rice that is very delicious. Next to the bowl of white rice, fragrant and hot is the sliced thin pork marinated with coconut milk. Grilled garlic with a few slices of cucumber and chili sauce is the diner can start a wonderful new day. This Chinese-style noodle soup is one of the perfect breakfasts for Cambodian people. Made from white noodles with sweet sauce, pork or beef, topped with onions, bean sprouts, chives, fresh shrimp mixed with spicy hot pepper. Cambodian noodles are a must-have dish when enjoying Phnom Penh tours. This is probably the "strange," delicious and nutritious food of the Cambodian people. Pumpkin, after dropping seeds, is stuffed with a thick mixture of egg yolks, sugar, and coconut milk, steamed for half an hour to make the pumpkin and the mixture ripen, then removed, cut into pieces of yellow, blended with milk color. It looks very nice, causing many "eating soul" people sobbed. Being the capital of Cambodia, Phnom Penh is a place where has the relatively pleasant and peaceful tropical monsoon climate. Phnom Penh has four seasons: Cold-dry season: November to February next year. Hot-dry season: March to May. Hot-wet season: June to August. Cold-wet season: September to October. Located in south-central Cambodia, Phnom Penh has relatively little change in weather in a year, the average temperature is always around 25 degrees Celsius when the coldest is 18 degrees, so it's only slightly cold. Although there are four seasons, we can feel that there are two main seasons. They are the rainy season and the dry season. The rainy season starts in June and ends in October. In the rainy season, the average temperature is 27 to 35 degrees Celsius. This is also the summer, so the temperature is quite high. The most obvious feature during this period is the high humidity, up to 90% because of the high rainfall. This can help plants grow and develop very well to create beautiful scenery. 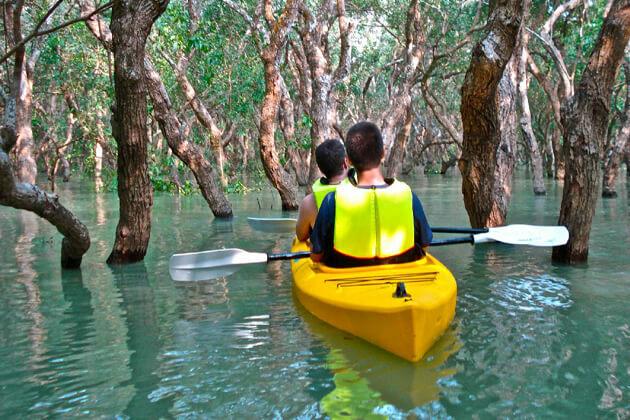 So if you travel to Cambodia at this time, you will have the opportunity to explore the lively and beautiful scenery. The rainy season in Phnom Penh will be divided into two smaller sub-seasons, which are the hot-wet season and the cold-wet season. The hot-wet season is from June to August and has a fairly high temperature, up to 35-37 degrees Celsius. Meanwhile, in the cold-wet season, the humidity is still high but the temperature drops to 20 degrees Celsius. The dry season begins in November and ends in May every year. Especially the dry season in Phnom Penh has not strong sunlight. Although in the hottest atmosphere, it may reach 35 degrees Celsius, the sun is not bright and the air is not sultry or uncomfortable. The dry season is divided into two sub-seasons: the cold-dry season and the hot-dry season. In the cold-dry season, from November to February, the weather is very cool. In the hot-dry season, the weather will be a little more uncomfortable when the temperature rises to fairly high levels but at this time, there are many interesting festivals. For example, the Bom Chaul Chnam, it is held for the purpose of celebrating the successful harvest and usually takes place in three days between April. The most suitable time for visitors to Phnom Penh is almost year round. If you want to enjoy the wild and ancient with a bit of mystery, you should come in the rainy season. If you want to admire the ancient architecture in the sun and watch the sunset in the ancient temple, you should come in the period from November to March every year. In each season, visitors have different senses and admire the different beauty. Coming to Phnom Penh, visitors can visit the royal palace, the Phnom Penh National Museum, the Phnom Penh Independence Monument, the Cambodia-Vietnam Friendship Monument, Tuol Sleng Genocide Museum, Wat Phnom,… These are also the most ancient and mysterious buildings of the Khmer people. Social Relations: Khmer people prefer to live in peace, away from crowded places. Buildings: Cambodians prefer to build houses facing south. When Entering the House: The left side of the house door is reserved for older people. On the right is a place for small children. Bedroom: Cambodians do not like strangers in the bedroom. Especially the bedroom of women and girls. They usually turn their heads toward the south. Abstinence: Cambodia abstained from the head. Therefore the bed head is more abstinence. Phnom Penh Psychological Characteristics: The Khmer people are honest and patient with difficulties, suffer from hardship in labor. Everyone wants to be polite in society. The elderly like being respected. Women are shy. Both young and old people are gentle, do not like people who brag and lie. So if anyone cheats the Cambodian only once, it is enough to lose all belief even lead to hatred. Customs and Practices: Cambodians often follow Buddhism. They have the habit of taking the veil before the marriage because the Khmer people in the past thought that: To take the veil means to get a new education and knowledge enough to earn money in society. At present, this custom is virtually eliminated. Each commune has its own school. 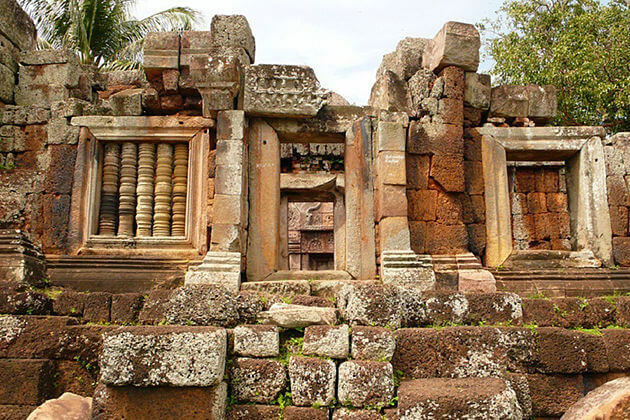 Superstitions: The Khmer in some areas are very trusting in evil spirits, gods, so they are interested in worship. This custom has been almost eliminated, only the worshipping their ancestors. Dress: - Like to dress for swank. - Kids: like colorful clothes. - Female: like harmonious color and jewelry - Men: by fashion. - Older: can shave head to "keep the five precepts" and wear white garments to the temple (on the 8th, 15th, 30th Buddhist monthly). Every year, Cambodia celebrates traditional holidays from April 13-15. When the New Year comes, the Khmer swept the village and repair the house. In front of the house, they put a table with candles, incense, flowers, and fruits to welcome God. Inside the house, they decorated very beautifully. At night they burned all sorts of lights and the brilliant lanterns. During the Lunar New Year, the Khmer people presented new clothes to the pagodas, prayed for good health and lucky things. About the boys and girls, they play dragons, throw towels, shoot indigo and dance. Phnom Penh - the place known as the jewel of Asia, is the largest city and the capital of the Kingdom of Cambodia. Phnom Penh has a fascination with French-style villas and boulevards bordering the ancient Angor architecture. The explosion of luxury buildings has turned the once deserted capital into a vibrant city, attracting many visitors. This city is the political, cultural, commercial center of Cambodia. From the tourist attractions in the capital, you can go out to explore the entertainment venues around Phnom Penh and neighboring provinces like Prey Veng (city), Takeo, Kandal, Kampong Cham,... Phnom Penh has received the award for the world's No. 1 leader in urban planning at the boom of the population. Particularly valuable products are found here including seafood, freshwater food, fresh fruit, traditional handicrafts, and art products. The Phnom Penh city was established in the 14th century and is associated with the legend of the famous Wat Phnom temple. Phnom Penh was the capital of Cambodia nearly 600 years ago when the Siamese occupied Angkor Thom, forcing King Ponhea Yat to abandon Angkor to reach this land. Phnom Penh was chosen because it was located in the center of the country near the big river. It is an important traffic hub, suitable for trade and commerce. Phnom Penh has experienced many ups and downs from the war against France to the Pol Pot genocide, which is considered to be the darkest period in the history of the country. With the help of Vietnam in the genocide, Phnom Penh is growing, roads, facilities, and modern trade centers are built. It became a major city attracting many international visitors, with many attractive tourist attractions and colorful festivals held every year. Phnom Penh has Pochentong International Airport to catch international travelers to travel. To visit the tourist attractions of Phnom Penh you can go by public transport such as bus, taxi but most special is still traveling by car Tuk-Tuk extremely interesting, It is a means not only to save money but also to experience every corner of the capital Phnom Penh. In the Phnom Penh tour, it is possible to travel by taxi, or tuk-tuk - a very popular means of transportation in Cambodia to save money. Especially the price of tuk-tuk here is listed so you almost do not need to worry about the price will be high. If you are healthy enough and want to explore every corner of Phnom Penh, you can also rent a bike to explore Phnom Penh as well as the Angkor temples. The price of renting tuk-tuk ranges from 1 to 2 dollars a day. This is a motorcycle with rear passenger compartment. It is one of the most characteristic facilities of Cambodia. But compared to other vehicles, Tuk-tuk is more popular and cheaper than other vehicles. The tuk-tuk drivers in Phnom Penh are very friendly, they can speak English. You should ask the price before hiring. Getting a tuk-tuk from the airport to the center of Phnom Penh costs about $ 6. Rent a car tuk-tuk city tour around Phnom Penh cost about $ 15. Taxis are not a popular means of transportation in Phnom Penh but are concentrated in the Sisowath Quay area. Taxis are available in two types: taxi with a meter counter and taxi with no meter counter (most taxis in Phnom Penh have no meter counter). Getting a taxi from the airport to the center of Phnom Penh cost about 8-10 USD. 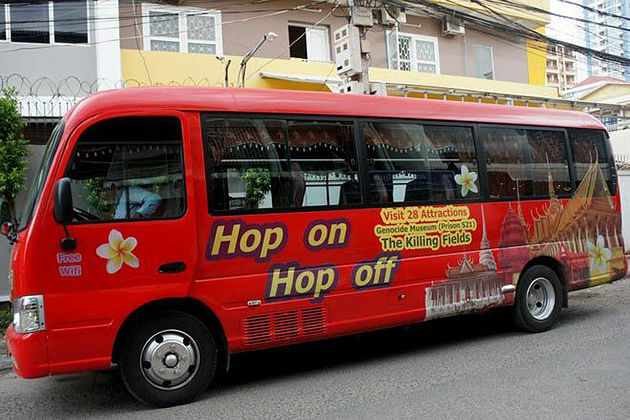 Travel in Phnom Penh for about 4-5 USD. Hire a taxi for about 30-35 dollars a day. Telephone / Fax / Internet in Phnom Penh (National code +855, city code 23). Most hotels and restaurants have internet and international phone services. International calls cost from $ 1.6 to $ 3 per minute depending on where you call. Call domestic rates 500-700 riel at street phone booths, which are usually pasted with multi-colored numbers "011, 012, 015, 016, 018" which are the start numbers for numbers mobile phone in Cambodia, which implies full service for all. Currently, visitors can have the tour guide to buy a sim card travel, the price is about $ 10 - $ 15 / sim, with $ 10 available in the account, the shelf life is 1 week. High-speed Internet services are available in Internet cafes and Internet cafes in cities and towns, with an average cost of around $ 0.5 / hr. Most of these stores have international fax and telephone services. However, visitors may be embarrassed to enter the internet cafe but do not provide internet access but rather sports betting services. Hotels also have internet access but are usually charged very high. Prepaid VoIP calling cards are available at grocery stores near gas stations in cities. In Phnom Penh, to send letters or postal parcels, to the Central Post Office on 13th Street, the west side of Wat Phnom is open from 06:30 to 21:00. International telephone and fax services are available, as well as book and stamp collections. 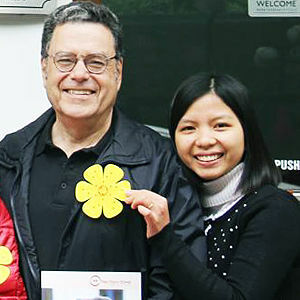 The principle of greeting in this country is simple: respond to all the greetings you receive. Absolutely do not rub the head of children because according to Cambodian, the head of a child is a very sacred place where only gods and their parents are touched. Do not put anything by the left hand because according to their custom, the left hand is "not clean". You should change your money and use Riel for paying less than $ 1, especially when traveling to the countrysides, as Riel is used in these areas. Please bargain before buying anywhere and check carefully before picking to avoid being fake. Please follow the instructions of the guide when entering the sacred temple area with the Cambodian. Cambodians worship Buddhism absolutely, so when you go to the temple, you must not wear a hat, shoes outside and not to stand near as well as touch the monk. Because the weather is very hot (maybe up to 40 degrees Celsius outside), you should wear cool clothes, shoes for climbing, drink plenty of water, always bring a hat, hat and do not climb the hot rocks. During the trip, to ensure safety, please leave in the safe in the room or send hotel reception ticket, passport, valuables, money. The Angkor Temple area is always crowded with visitors. In case of getting lost, go to the Tourist Police (always in the temple) and ask for your arrival. In the Angkor area, most of them do not catch cell phone waves, so you will have to leave out of the Angkor area.